The most important aim of modern organic chemistry is to replace the old, environmentally hazardous, expensive and less efficient processes with new, energy efficient routes of synthesis. 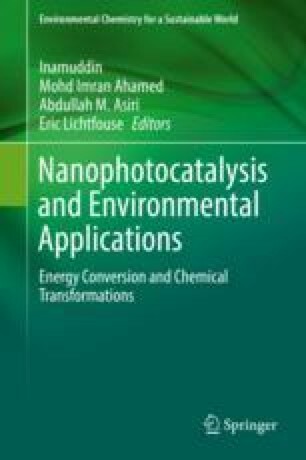 In this regard, during the past 10 years, heterogeneous photocatalytic systems have been identified to have made it possible to perform green synthesis of a number of industrially important compounds. This is primarily attributed to its low-cost, ease of availability, simple chemical workup and eco-friendliness. In spite of the significant achievements being made in this field, major challenge pertains to the lack of selectivity. Much of fundamental knowledge pertaining to the reaction conditions such as solvent used, pH, intensity of irradiation, chosen photocatalysts and reaction conditions remain unknown for many synthesis applications. Thus this chapter will review the major achievements that have been made in this field. A review of the state of the art progresses in the use of common photocatalytic materials for the purpose of organic synthesis through four important classes of organic synthesis, namely, oxidation of alcohols, oxidative cleavage of olefins, reduction of nitro compounds, and cyclisation; carbon-hetero bond formation and alkylation will be reviewed.